JP 2007-06-26 600 points ? 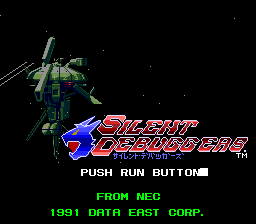 Silent Debuggers (サイレントデバッガーズ) is a first person shooter for the PC Engine and TurboGrafx-16. Predating both Doom and Wolfenstein 3D, Silent Debuggers seems to be an evolution of first person dungeon crawlers such as Wizardry, but with real time action, a science fiction setting, and none of the usual stat or level building that comes with an RPG. Like a dungeon crawler, movement is grid based, and your character can only turn in 90% angles. The game takes place in a space station that has become infested with aliens. The central section is an elevator that lowers to another level when all of the aliens are killed on the current level. This central area is divided into 8 main rooms. B Block controls the lights, C Block recharges your batteries, F Block allows your sound sensors to work, G provides ammunition, and the other 4 don't provide any specific function. Starting in the second level, certain types of aliens can enter this central section and attack these rooms. If one of these rooms is destroyed, it no longer provides whatever function it did before. However Leon, who stays in the central computer room, will usually give you a new item that somewhat replicates the function of the now destroyed room (i.e. if you lose C block, he gives you an item that gradually refills your batteries when you have it equipped). If all 8 rooms are destroyed, it is game over. Any damage done to any room stays until the entire game is completed. There is no way to repair them at all. Similarly, the ammunition room has a limited supply of ammunition for the whole game, and once it's out, it's out until a game over. Between this and the mechanic of having to carefully track down aliens with a radar, it's arguable that Silent Debuggers is a proto-survival horror game. Main article: Silent Debuggers/Magazine articles. This page was last modified on 6 April 2019, at 21:41.